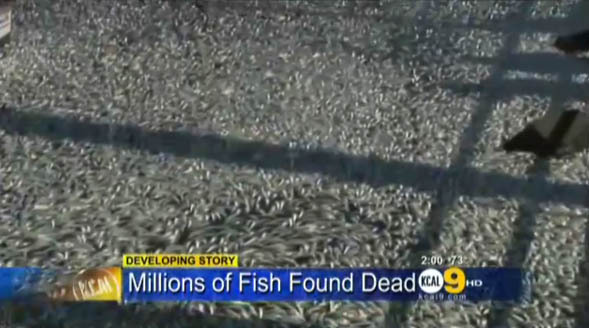 According to CBS Los Angeles, millions of sardines were swept into the Redondo Beach harbor. The surface of the water was absolutely covered by literally thousands of pounds of fish, reaching a thickness of one foot in some places. The Department of Public Works is responsible for the cleanup, which they say is going to take days. Sardines move in “bait balls”, enormous schools, and it seems as if they ended up in the harbor where they quickly consumed the available oxygen. This is believed to be the cause of the massive death, as no toxins were found in the initial testing. This is just an example of just how vital water movement and oxygenation are to marine life. If our tanks, during power outages, it is a lack of oxygen which can cause the most immediate damage. Check out our Reef Emergency Kit article, and remember to agitate the water manually if no other choice if available. I don’t know of I buy that explanation..
You should. This is a yearly occurance with both anchovies and sardines. Come to Santa Cruz and visit the harbor. Look at all the devices they have spent hundreds of thousands of dollars to procure and upkeep. Large schools of fish die all around the globe due to O2 starvation.